March is not leaving like a lamb. Lake Massawippi is still frozen solid, snow still covers the ground and today the wind is blowing fiercely. These unusually late winter conditions are discouraging, to say the least. But on the up side, they are giving me time to review some of the blogs I’ve written since I posted for the first time in January 2013. 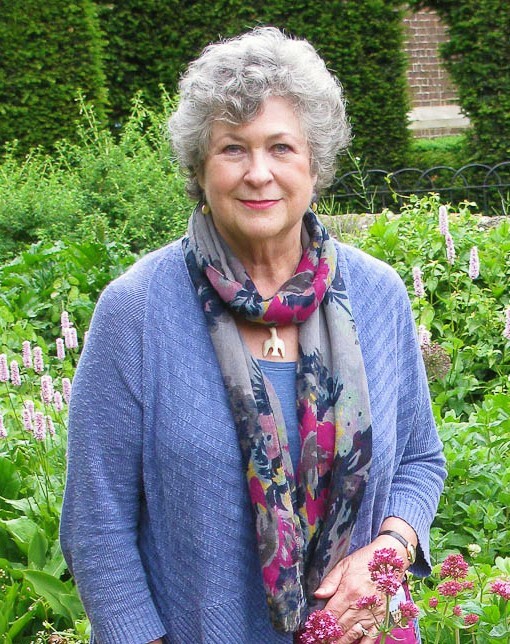 Over six years, in hundreds of blogs, I’ve reviewed books and gardens, considered issues in garden design, looked at how art is used in gardens and chronicled the development of the garden at Glen Villa, my garden in Quebec. I’ve also profiled plants. Those plant profiles are the ones I’ve been reading most happily — they remind me of the pleasures soon to come. 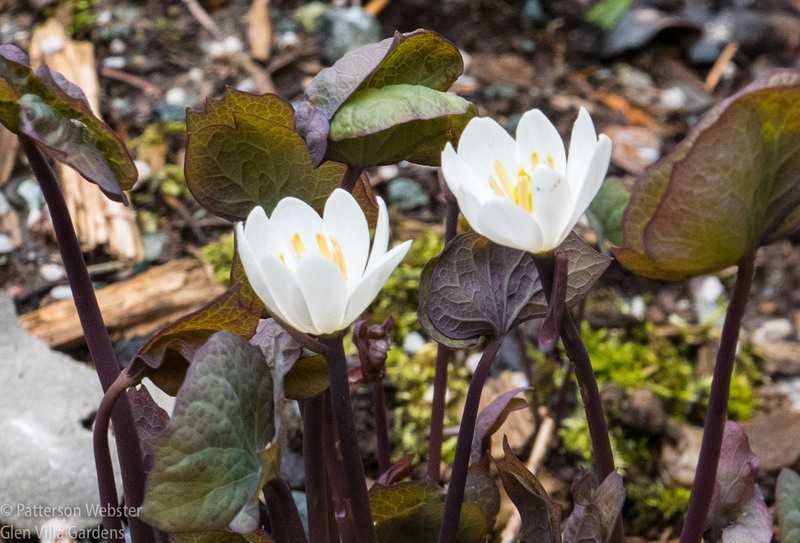 One of the flowers I look for most eagerly in the spring is Jeffersonia diphylla. I wrote about the plant six years ago and my love for the plant hasn’t changed since. So, with some new photos and some revisions in the text, here is that blog post again. Jeffersonia diphylla grows in shady woodland conditions. Gardeners in temperate climes may wonder why I love Jeffersonia diphylla. For them it grows easily, spreads nicely and offers a touch of light in a shaded border. A nice plant, but nothing special. Jeffersonia doesn’t grow easily for me. I have to coddle it, and it is one of the few plants at Glen Villa that gets this care. As for spreading nicely, no such luck. My one plant grew for quite a few years before it produced a baby. I’m still waiting for more. Nonetheless, Jeffersonia is my favourite plant. Not because it is carefree, but because it speaks of childhood and of Virginia, where I grew up. Jeffersonia is a true Virginia plant, named by the American botanist Benjamin Smith Barton after the many-talented Thomas Jefferson. It is a spring ephemeral, as fleeting as childhood itself, blooming so briefly that some years I miss the white flowers altogether. It is also a plant whose character and appearance shift delightfully throughout the growing season. 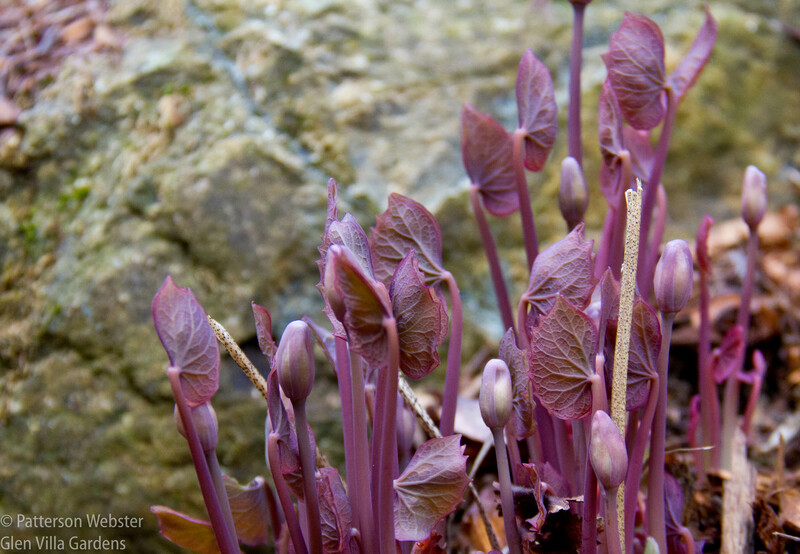 Shortly after the ground thaws, which in Quebec can be as late as mid to late April, tiny tips of reddish-purple begin to peek up from the bed outside the kitchen door. These small tips are hard to see at first — they are almost the colour of the mulch that surrounds them. But soon pale vampire-like spears appear, desperately searching for sunlight instead of avoiding it, as any sensible vampire would do. Leaves begin to develop. At first they are the colour of bloody wine — a Merlot perhaps? Prominent veins make them look soft and vulnerable. Gradually, the short-lived flowers form. They open like cups held atop rigid stems. They are stately, elegant. The Merlot tones remain at the edge of developing leaves. 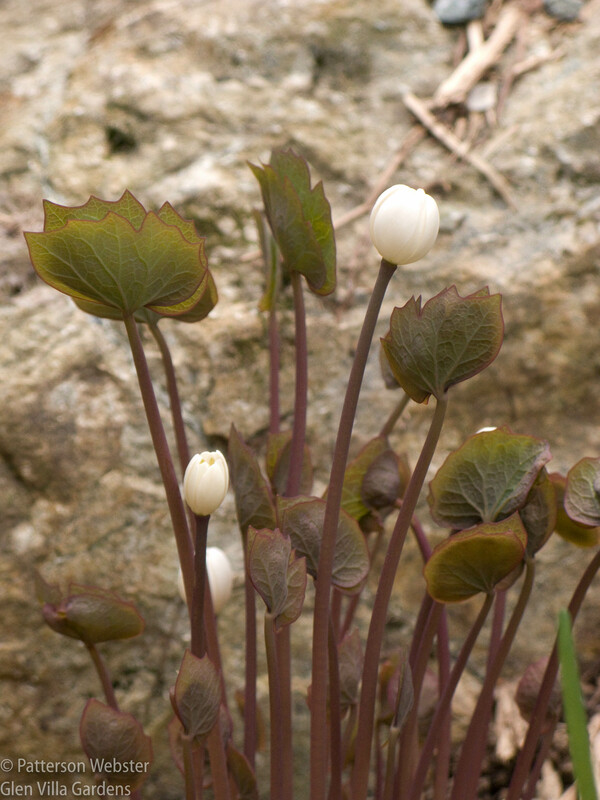 Jeffersonia is a typical spring ephemeral. In a good year, when the weather is cool, the flowers may last a week. More typically, they last three or four days. There is a purity about the flowers of Jeffersonia diphylla that wasn’t always echoed in the real man’s life. 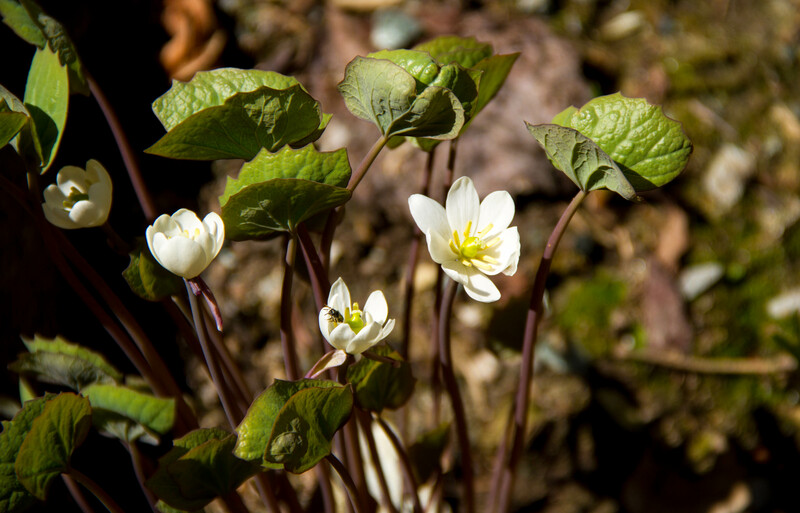 Jeffersonia’s white petals surround a sunny yellow centre that develops into the seed head. The second show begins as the leaves grow bigger and broader. They change colour to a soft blue-green, and as they do, the second part of the plant’s name becomes self-explanatory. Di-phylla: two leaves. Those twin lobes also explain the plant’s common name, twinleaf. The veins that were so prominent in the Merlot-toned leaves remain visible here, joined by tiny raindrops that spill down the twin leaves like tears. 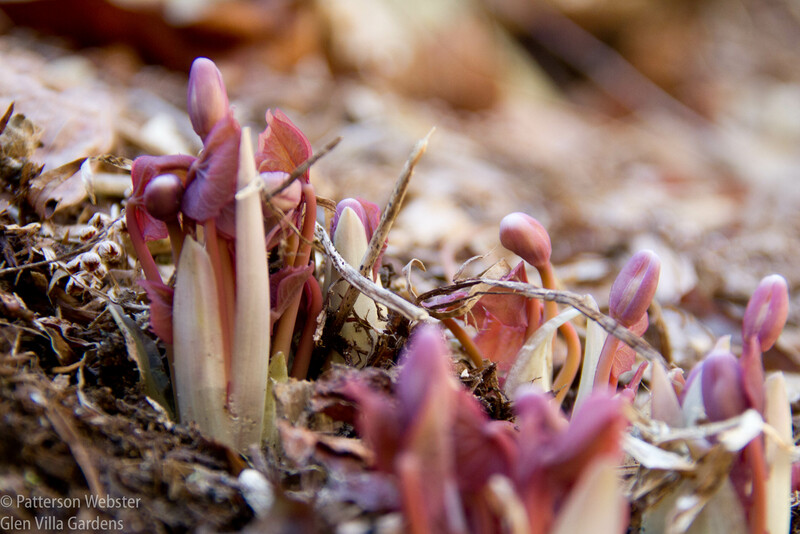 Jeffersonia is a chameleon, constantly changing — but never blending in. 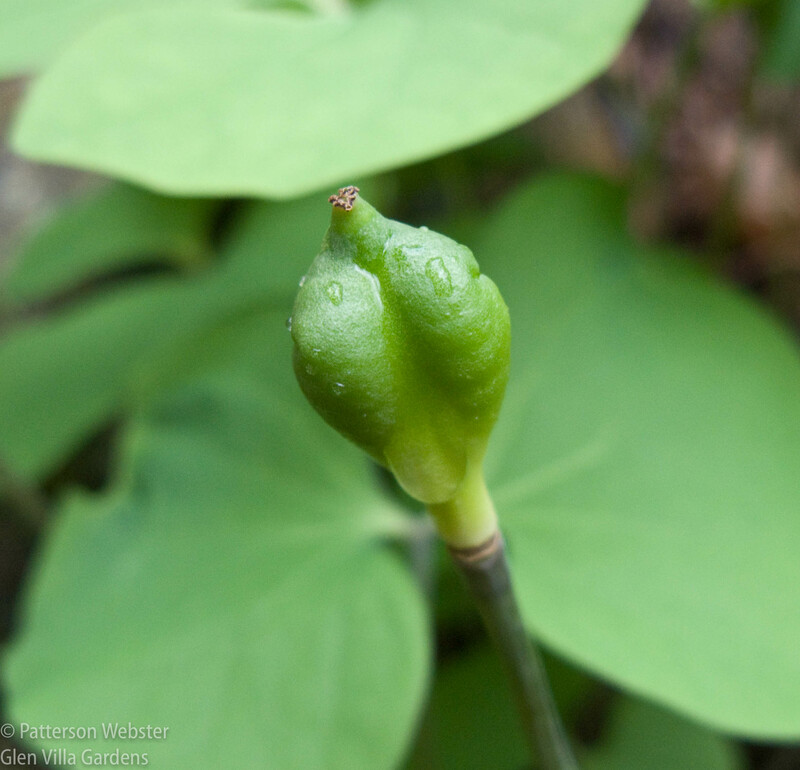 The tender, vulnerability of early spring becomes comedic in mid-summer when the seedpod starts to form. 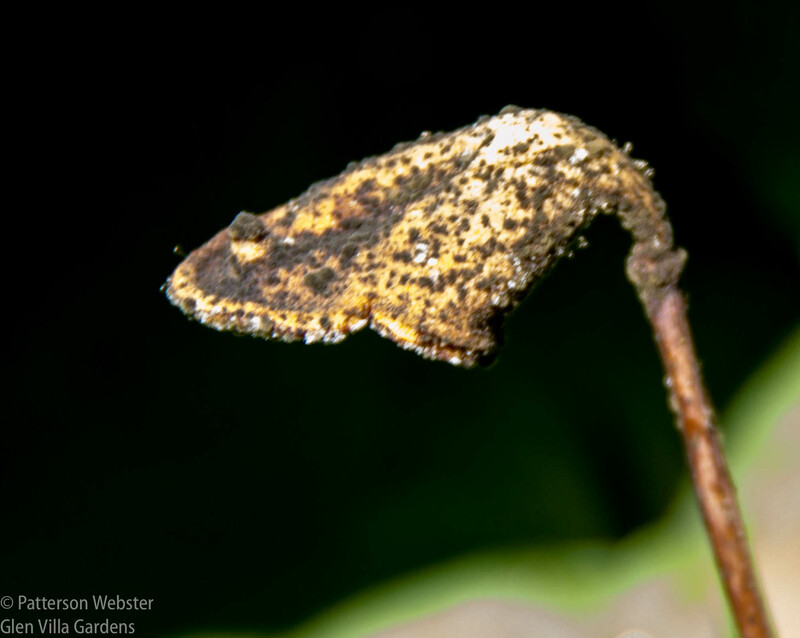 The twin lobes of the seed pod remind me of ET, the young alien in the movie from the 1980s. Then the plant begins to smile. Rather smugly, I have to say. 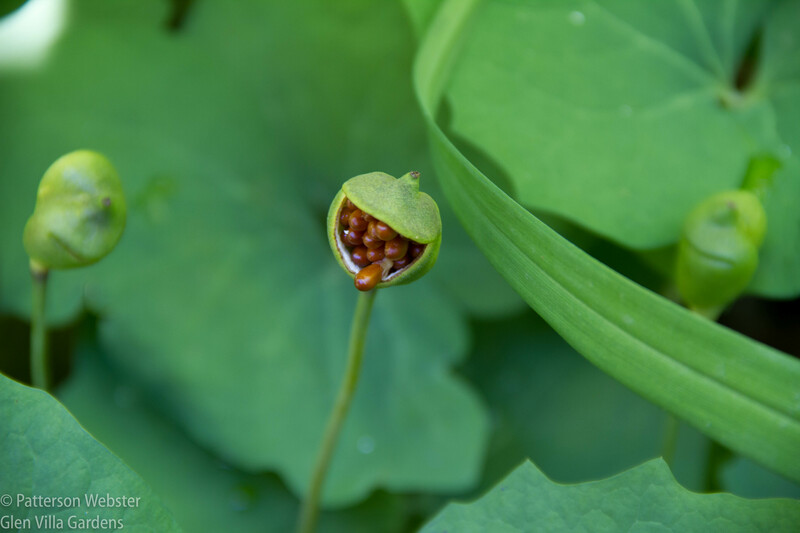 The seedpod is hinged, and when it opens, Jeffersonia’s full smile displays a mouthful of cinnamon-coloured seeds. Then the plant spits the seeds out, one by one. Caught in the act! I was lucky to get this photo. Approaching the finale, Jeffersonia turns yellow. 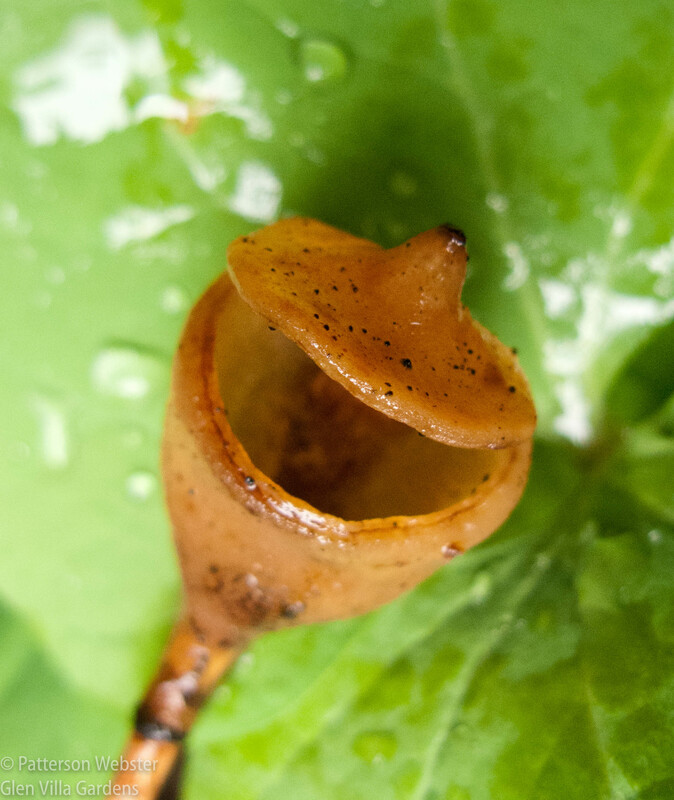 The hinged seed pod’s mouth is now toothless, suggesting what is next to come. All good things end. Eventually, Jeffersonia goes spotty and starts to shrivel, like a wizened comedian who walks with a cane. Do you see a cane or an inverted pipe? Or neither? 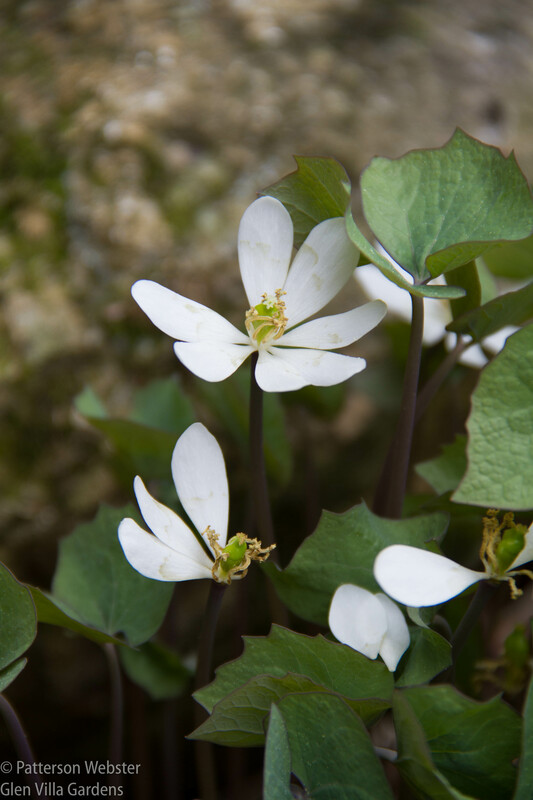 On a practical note: Jeffersonia grows best in rich woodland conditions: moist, well-drained, slightly acidic soil. It likes part shade and tolerates full shade. According to the Missouri Botanical Garden, it is native from New York to Wisconsin, south to Alabama and Virginia. It grows to about 8 inches when in flower and continues to grow through the summer, eventually reaching about 18 inches. All this tells me that Jeffersonia shouldn’t thrive outside my kitchen door. But it does. And I thank it for providing such a good show, year after year. What a pleasant story of hope to read on such a day as today, when hope of plant life seems so far off as to be unlikely…. Hoping to see plant life is precisely why I wrote it — better than moaning on about the weather. I think someone should have a little chat with Punxsutawney Phil but here’s hoping things change for April Fool’s! No change for April Fool’s Day — only another snowfall! Sun has just come out so the inch or so that fell will melt quickly, I hope. I have a very small patch of twinleaf myself, but after reading your imagery I’ll be looking at it with fresh eyes. Hoping your snow melts quickly! 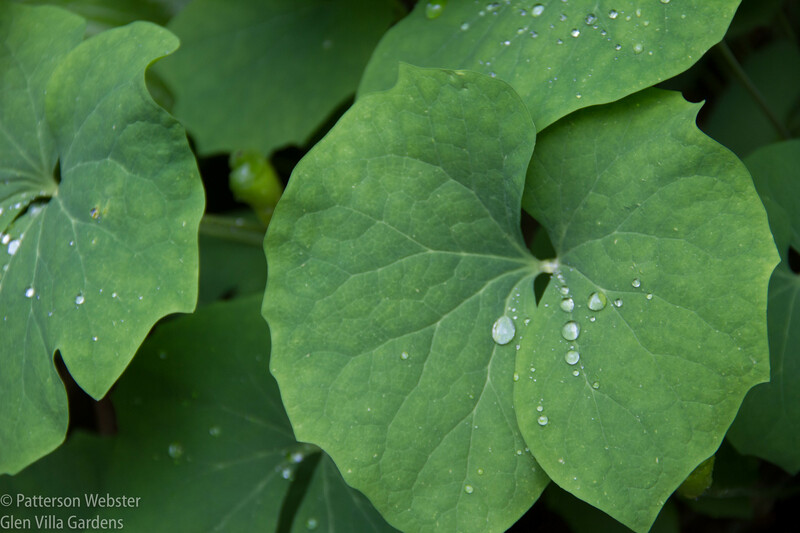 Is your patch of twinleaf in the woods and did you plant it or was it there? My one plant is now four or five but all in cultivated beds. Id love to naturalize it but would need to be confident it would survive. The twinleafs I grow were purchased. I started them out in a cultivated bed. Once they seemed established, I moved some of them into the woods (my Secret Garden, where I do keep an eye on them) and left some where they were. When the ones in the woods seemed to do fine, I moved some more to a different place in the woods. They do seem to be increasing, but I’m not sure if it’s by seed or general expansion of the clump. thanks for the info, Kathy. If I could find a supplier with a good quantity of plants, I’d do the same. I bought a single plant in two different years from a native plant society plant sale. After that, it was just patience waiting for them to bulk up. I love this native, too. We just have one plant, in our WNC garden, but it’s flowering now. So lovely. 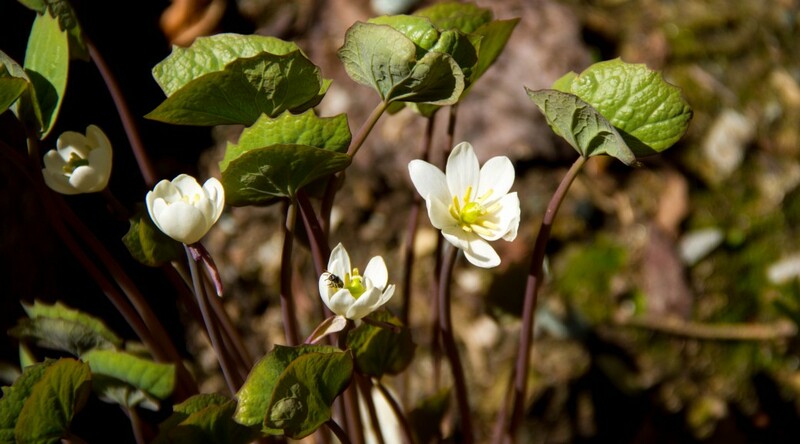 I also love bloodroot as one of the first spring native wildflowers that we see. So heartening as we look towards spring and the growing season. 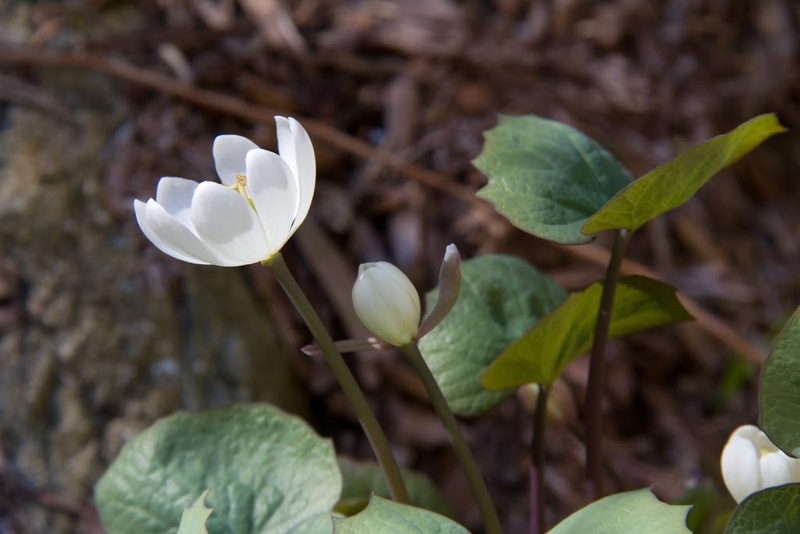 Bloodroot grows wild in our woods but not Jeffersonia. Following Kathy Purdy’s lead, I may try to naturalize some. 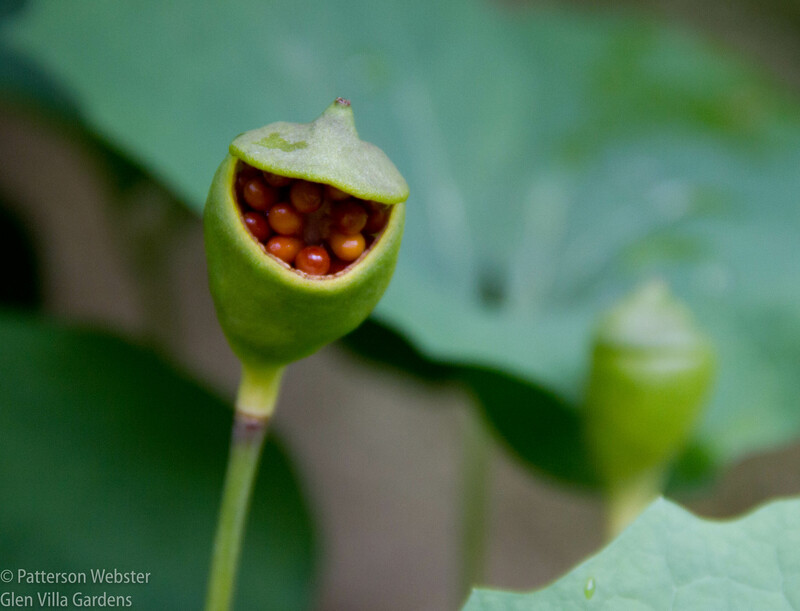 Love the photos of the smiling plant with the mouth full of seeds. I was so lucky to get that photo — it’s a real winner!